BACKGROUND AND PURPOSE: An epidemic of suspected Japanese encephalitis occurred in Malaysia in 1998–1999 among pig farmers. In neighboring Singapore, an outbreak occurred among pig slaughterhouse workers. It was subsequently established that the causative agent in the outbreak was not the Japanese encephalitis virus but a previously unknown Hendra-like paramyxovirus named Nipah virus. METHODS: The brain MR images of eight patients with Nipah virus infection were reviewed. All patients tested negative for acute Japanese encephalitis virus. Seven patients had contrast-enhanced studies and six had diffusion-weighted examinations. RESULTS: All patients had multiple small bilateral foci of T2 prolongation within the subcortical and deep white matter. The periventricular region and corpus callosum were also involved. In addition to white matter disease, five patients had cortical lesions, three had brain stem involvement, and a single thalamic lesion was detected in one patient. All lesions were less than 1 cm in maximum diameter. In five patients, diffusion-weighted images showed increased signal. Four patients had leptomeningeal enhancement and four had enhancement of parenchymal lesions. CONCLUSION: The brain MR findings in patients infected with the newly discovered Nipah paramyxovirus are different from those of patients with Japanese encephalitis. In a zoonotic epidemic, this striking difference in the appearance and distribution of lesions is useful in differentiating these diseases. Diffusion-weighted imaging was advantageous in increasing lesion conspicuity. An epidemic of fatal infectious encephalitis occurred among pig farmers in Malaysia in 1998–1999 (1). The causative agent was initially thought to be the Japanese encephalitis virus, which is endemic in Malaysia and many parts of Asia (2). In March 1999, however, viral isolates and serum samples revealed evidence that a previously unknown virus was the major cause of the encephalitis outbreak. This novel virus (3) is taxonomically distinct from the Japanese encephalitis virus and has now been named the Nipah virus and classified as a member of the Paramyxoviridae family. Preliminary data indicate that human Nipah virus disease is a zoonosis; contact with pigs appears to be necessary for human infection (4). In this report we describe the distinctive MR findings in an animal-borne epidemic caused by this novel paramyxovirus. Although there is a case report in the literature (5), to our knowledge, there has been no documented series analyzing the imaging findings of CNS disease caused by this emerging infectious agent. The brain MR findings of eight patients who were diagnosed with Nipah virus infection were reviewed. Six of these patients were pig slaughterhouse workers in Singapore. Two patients were pig farmers (patients 2 and 3) who lived and worked in neighboring Malaysia, but who sought medical treatment in Singapore. All patients were included on the basis of epidemiologic and clinical diagnosis or by serologic diagnosis of Nipah virus infection using an enzyme-linked immunosorbent assay kit developed by the Centers for Disease Control and Prevention (3). Those patients who did not undergo neuroimaging were excluded from the present discussion. Imaging was performed on 1.5-T MR scanners between the 1st and 12th day of hospital admission. All patients underwent T1-weighted axial imaging, 400–660/12–14 (TR/TE), and axial fast spin-echo (FSE) T2-weighted imaging, 3500–5400/83–105 (TR/TEeff). Six patients had diffusion-weighted imaging performed with single-shot spin-echo echo-planar imaging (EPI) sequences. Diffusion-sensitizing gradients were applied in three orthogonal planes (8000–10,000/105–173) and b values were set at 750 to 1000 s/mm2. The isotropic diffusion-weighted images were reviewed. Echo-planar fluid-attenuated inversion recovery (EPI-FLAIR) images (TI = 2200) were simultaneously acquired in five of these patients. Matrix size was 128 × 128, and acquisition was done after one excitation. Three patients were studied with FSE FLAIR (9000/110; TI = 2500) and one patient had a proton density–weighted study (3800/22). An axial gradient-recalled-echo sequence was performed in two patients (980/40; 20° flip angle). All images in all sequences were 5-mm-thick with a spacing of 2 or 3 mm. Contrast-enhanced studies were obtained in seven of eight patients, who received 0.1 mmol/kg body weight of intravenous gadopentetate dimeglumine. Attempts at contrast enhancement were abandoned in patient 4 after he became restless. Despite the limitations of monitoring seriously ill, intubated patients (patients 1 and 7) and the universal precautions taken for an infectious disease, all studies were successfully completed, although there were some degraded images (patients 3 and 8). All MR images were interpreted consensually by five experienced radiologists. The clinical findings in the eight patients are summarized in Table 1. The CSF of all eight patients proved negative when tested for neurotropic viruses, including the Japanese encephalitis virus. Serology was also negative for acute Japanese encephalitis infection. Table 2 summarizes the MR imaging findings. In all patients, multiple, bilateral, small lesions were detected in the white matter (Figs 1 and 2). There were abnormalities in subcortical as well as deep locations, including the periventricular areas. The internal and external capsules were involved, and four patients had lesions in the corpus callosum (Fig 3). In two patients, brain lesions were limited exclusively to the white matter. Cortical lesions were present in the other six patients and involved the frontal, parietal (Fig 4), and temporal cortices. The hippocampal gyrus was affected in two patients. In five of six patients, lesions in the cortex were seen together with white matter disease; only one patient had more cortical than white matter lesions. The pons was involved in three patients, and the cerebellar peduncle in one patient. In patient 6, a single small lesion was seen at the edge of the thalamus. There was no evidence of involvement of the basal ganglia. A, Multiple punctate white matter lesions (arrowheads) are visible on T2-weighted FSE MR image (4000/105). B, The largest lesion is more prominent on corresponding diffusion-weighted image (10,000/105; b = 1000). 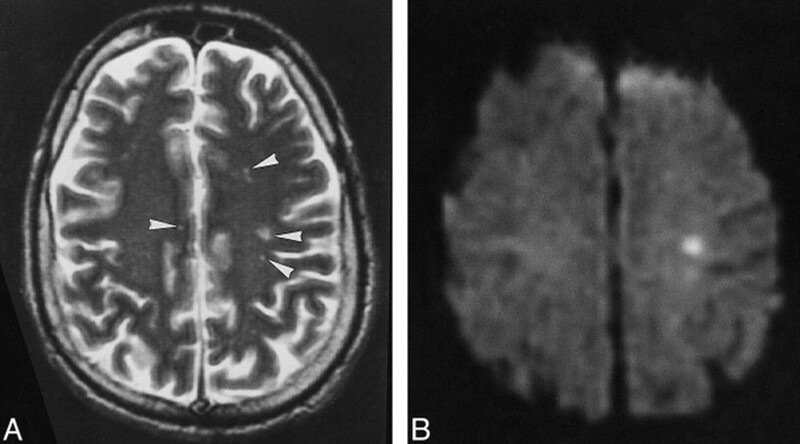 A and B, Proton density–weighted (A) and T2-weighted FSE (3800/22,90) (B) MR images at different levels show innumerable small lesions scattered throughout the white matter bilaterally. A, T2-weighted MR image (4000/105) shows a lesion in the corpus callosum (arrowhead) and several smaller punctate hyperintensities (arrows). B, Only the larger lesion in the corpus callosum is visible on corresponding diffusion-weighted image (10,000/105; b = 1000). C, Axial contrast-enhanced T1-weighted image (540/14) shows several foci of enhancement (arrows). D, Hyperintensities are seen in the pons and cerebellar peduncle (arrows) on T2-weighted image. A, Cortical hyperintensity (arrow) is poorly seen on this degraded T2-weighted MR image (5400/99). B, The lesion (arrow) is much better visualized on FLAIR image (9000/110; TI=2500). C, Coronal contrast-enhanced image (665/20) shows gyriform enhancement in the parietal cortex (arrow). All white matter lesions were small, measuring less than 1 cm in maximum diameter. The size of the lesions varied from tiny punctate foci of T2 prolongation to a 9-mm flame-shaped periventricular lesion. Gray matter lesions were also subcentimeter in size, with the exception of those in patient 7, who had abnormalities of the hippocampi bilaterally. Of the six patients who underwent diffusion-weighted imaging, abnormal areas of hyperinten-sity were seen in five. These lesions were also abnormal on corresponding T2-weighted images. Fewer lesions, however, were detected on diffusion-weighted images than on T2-weighted images; very small lesions (1–2 mm) were not seen on the diffusion-weighted scans. No hemorrhage or susceptibility from blood products was detected on a gradient-echo sequence performed in two patients. After contrast injection, generalized leptomeningeal enhancement was seen in four patients. In another four patients, cortical enhancement (Fig 4C) or poorly defined, faint, and punctate enhancement of white matter lesions was noted (Fig 3C). During the early days of the outbreak of Nipah virus encephalitis in Malaysia, the causative agent was thought to be the Japanese encephalitis virus. Pigs are the amplifying hosts and the virus is transmitted to humans by Culex mosquitoes. Despite antimosquito measures and vaccination against Japanese encephalitis, the outbreak could not be controlled and there was a high toll of mortality and morbidity (1). In Singapore, which imports live pigs from Malaysia, a cluster of cases of presumed Japanese encephalitis occurred among workers at a slaughterhouse. The clinical and epidemiologic features of this outbreak have been described in detail (6, 7). Although the clinical syndromes of viral encephalitis are not specific for the causative organism (8), the imaging findings for Japanese encephalitis have been well established: the virus affects mainly the thalamus bilaterally, and also the basal ganglia, brain stem, and hippocampus (9). Classically, these lesions are hyperintense on T2-weighted MR images and hypointense on T1-weighted images, with hemorrhagic transformation being described in the thalamus and cortex. Viral antigen has been localized to neurons, with the greatest involvement in the thalamus and brain stem (10, 11). White matter involvement has been reported in Japanese encephalitis (9, 12, 13), but this has always been in combination with the more characteristic gray matter lesions. 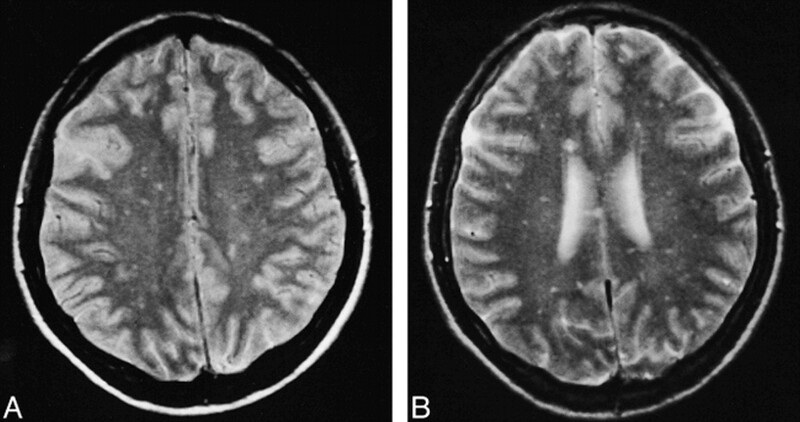 A literature search of the appearance of Japanese encephalitis on CT and MR studies yielded no reports of white matter involvement in the absence of thalamic lesions. By comparison, the bilateral thalamic lesions and basal ganglia involvement typical of Japanese encephalitis was conspicuously absent in our series of patients. The most striking imaging feature was the white matter distribution of multiple, small lesions less than 1 cm in size. Since this pattern is so distinct from the typical imaging appearance of Japanese encephalitis, there was a strong suspicion that these patients were affected not by the Japanese encephalitis virus but by a different pathogen. Subsequent negative test results for the Japanese encephalitis virus, and the news that a previously unknown virus had been discovered, provided positive confirmation. We believe that recognition of the MR pattern is useful in differentiating the two viral encephalitides, particularly at the height of an epidemic before serologic confirmation is available. 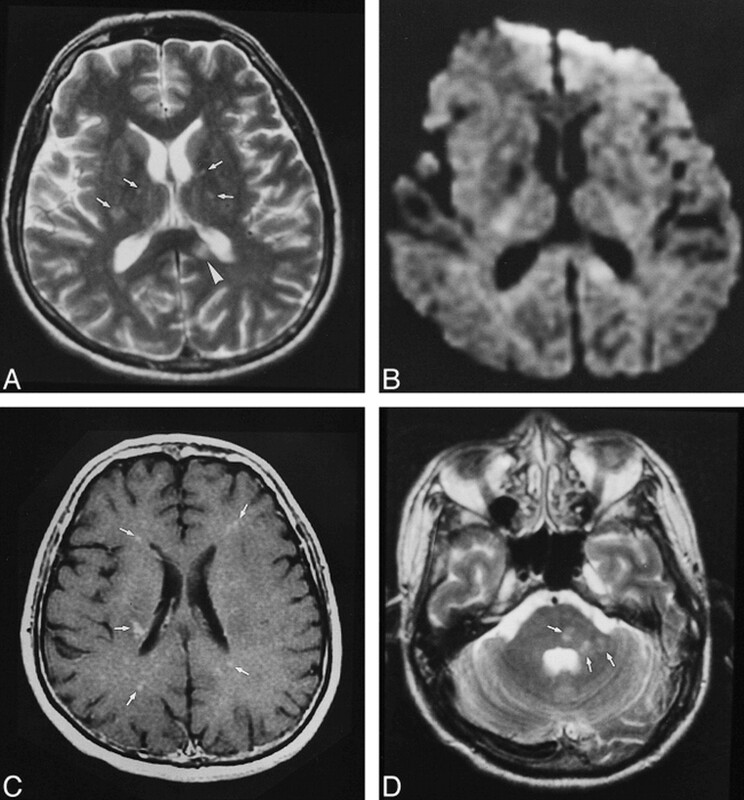 Although the MR findings were not typical of Japanese encephalitis, other causes of widespread multifocal white matter lesions needed to be considered. Acute disseminated encephalomyelitis (ADEM), also called postinfectious encephalitis (14), is an autoimmune demyelinating disease that can occur after measles, mumps, an upper respiratory infection, or vaccination. Reported cases of ADEM after Japanese encephalitis vaccination (15) caused us to suspect initially that these lesions could have been caused either by Japanese encephalitis or by Japanese encephalitis vaccination. Increased rather than restricted diffusion, however, has been reported in ADEM (16). Finally, the isolation of a new, hitherto unknown virus led us to discard the ADEM hypothesis. The appearance of scattered punctate white matter abnormalities is unlike the manifestations of viral diseases, such as Japanese encephalitis or herpes virus, which affect neurons in the gray matter. Several infectious agents have been reported as the cause of such widespread small lesions in the brain, including Rocky Mountain spotted fever (17), Lyme disease (18), cryptococcosis in immunocompromised patients (19), and even cerebral malaria (20). It has been postulated that a perivascular inflammation may be responsible for the dilated Virchow-Robin spaces or small end-artery lesions seen in Rocky Mountain spotted fever encephalitis (17). The Nipah virus is a newly discovered agent, and how it causes disease is still largely unknown. As more radiologic and pathologic data on the Nipah virus are collected, evidence may emerge that might support a hypothesis of a vasculopathic pathogenesis. The lesions on MR images did not explain all the clinical manifestations. Five patients in our series had clinical evidence of cerebellar disturbance, but in only one patient was a lesion detected in the cerebellar peduncle (Fig 3D). Bilateral hippocampal involvement was found only in the single fatal case. It remains to be seen, in a larger series of patients, whether involvement of the cortex and hippocampus may be a useful prognosticator of unfavorable outcome. In imaging studies of acute brain ischemia, diffusion-weighted sequences have been shown to be sensitive to cytotoxic edema (21). Diffusion-weighted imaging findings have also been reported to be abnormal in CNS infection (22–25). In several patients in this series, we found that the brightly hyperintense foci of restricted diffusion increased lesion conspicuity, particularly in those lesions that were of doubtful significance on T2-weighted sequences. Nevertheless, not all lesions seen on T2-weighted images were visible on diffusion-weighted images. Those smaller than 3 mm are probably below the resolution of our acquisition parameters of a 128 × 128 matrix and a 5-mm slice thickness (26). As techniques in functional MR imaging improve, and as apparent diffusion coefficient maps or diffusion tensor imaging become more widely available, the diffusion abnormalities in this disease may be characterized more accurately. The Nipah virus shares many similarities with the Hendra virus, which is another newly isolated member of the Paramyxoviridae family causing zoonotic disease in humans and horses in Australia (27, 28). In the single published imaging report of the prototype Hendra virus encephalitis, MR images showed widespread cortical lesions but with sparing of the subcortical white matter (29). The authors of that report noted similarities between their case and subacute sclerosing panencephalitis, a specific syndrome caused by the measles virus: the prototype paramyxovirus. Whether the Nipah virus, which belongs to the same Paramyxoviridae family, is capable of causing a similar viral reactivation, and whether patients at risk may benefit from follow-up imaging, are issues that remain to be examined in further studies. CNS infection by the Nipah virus predominantly involves the white matter and also affects the cortex and brain stem in some patients. The distribution of many small, subcentimeter lesions is unlike the characteristic imaging features of Japanese encephalitis. Recognition of this MR pattern may prove useful in distinguishing the etiologic agents during an outbreak of pig-related encephalitis. Diffusion-weighted imaging, although insensitive for smaller lesions, was advantageous in making lesions more conspicuous and therefore in increasing diagnostic confidence. The data on this new virus are still emerging. We gratefully thank Richard Johnson and Bill Dillon for their encouragement, and Asok Kurup, Lee W.L., Alex Auchus, Wong M.C., Lee C.C., Lim T.A., Lin B.K.M., Tan A.P.K., and Haslindah Salim for their assistance. ↵1 Address reprint requests to Dr. C. C. Tchoyoson Lim, National Neuroscience Institute, Irrawady Block, 11 Jalan Tan Tock Seng, Singapore 308433.